Natural stones are items that stay with people in their everyday life. 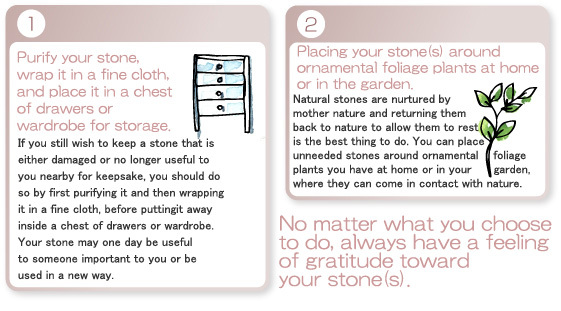 ANAHITA's Life Cycle Stone is a guide to choosing the right stone and what to do when you no longer need the stone (by returning it to the right place with gratitude), as well as how to find a new stone. What do I do when I no longer need my stone, or when it is damaged? After transferring your thoughts to a stone over the years it can also age. Or, you may stop wearing your stone due to a change in your living environment, or you may have found another stone that attracted you. When you no longer use your stone, when your wishes came true, or when the stone is damaged and is no longer useful to you, you shouldn't simply throw it away in the trash—it's a very sad thing to do to the stone. You should follow the following methods to let the stone that has been taking care of you rest, before looking for a new one that suits your current conditions.